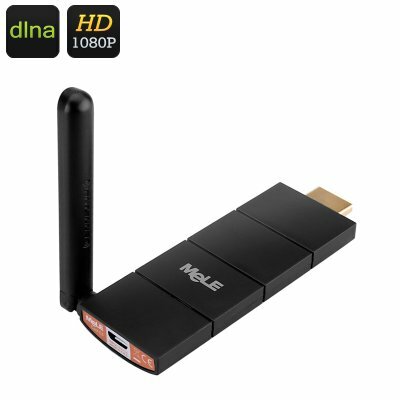 Successfully Added MeLE Cast S3 HDMI Dongle - DLNA, Miracast, Airplay, iOS, Android, Mac, Windows, 1080P to your Shopping Cart. The MeLE Cast S3 is a new TV Dongle allowing you to stream media to your TV. With Airplay and Miracst supported you can steam media from iOS 6.0, Android 4.0 or even Windows XP, 7 and 8 devices so sharing all your content on a TV couldn't be simpler. Thanks to its external antennary this wireless dongle boasts a strong Wi-Fi signal meaning there is less interruptions and interference when it's in use. With its 1080p output resolution you can enjoy full HD quality on any compatible HDMI screen. It's not just images and movies that can be streamed, with the EZCast app you can surf the web, play music access cloud storage and even view your devices camera output all on your HDMI screen - just open the app on your iOS, Android or Windows device and link it up to the MeLE HDMI media dongle. The MeLE Cast S3 TV Dongle comes with a 12 months warranty, brought to you by the leader in electronic devices as well as wholesale TV sticks and dongles..